Don Jamieson is set to release his second album on March 18th on Metal Blade Records! Hell Bent for Laughter was recorded in December of 2013 at Uncle Vinnie's Comedy Club in Pleasant Beach, NJ. The BYOB club, one of Jamieson's favorites on the East Coast, turned out to be the perfect venue for Don's straight-forward, irreverent comedy! Fans can listen to the opening track from the album, including an intro from UFO's Vinnie Moore and Jim Florentine at metalblade.com/donjamieson. An iTunes version with an exclusive bonus track is also available for pre-order now. 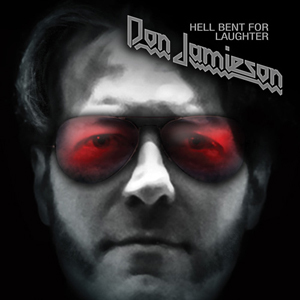 Don Jamieson comments: "I'm really pumped to unleash my second stand-up comedy CD, Hell Bent For Laughter, on the masses. In this day and age of "fake outrage," Metal Blade never asked me to tone it down or soften anything up. So I didn't." Don Jamieson began his writing and stand up career nearly two decades ago as one of the young and talented comedy minds at MTV, helping to launch the careers of comics like Jon Stewart, Kevin James, Pauly Shore and Tom Green. Amongst his many accomplishments, Jamieson won an Emmy for his work on HBO's Inside the NFL. Additionally, Jamieson co-stars on That Metal Show on VH1 Classic with Eddie Trunk and Jim Florentine. To date, That Metal Show is the longest running original program in the history of the network. Don Jamieson's previous album, Live and Hilarious, debuted at #9 on Billboard's Comedy Albums chart among albums from Louis C.K., Mike Birbiglia, Daniel Tosh and more. The album also debuted at #17 on the iTunes comedy charts.